The Ford brothers, Robben, Patrick and Mark, have always expressed their appreciation for Mike Bloomfield and Paul Butterfield, two innovative blues players from Chicago. Without their music the musical directions of the Ford brothers might well have taken totally different directions. 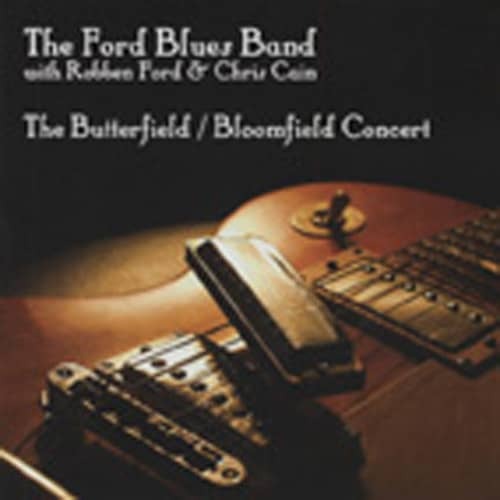 Recorded live, the Ford Blues Band (augmented by Robben, Chris Cain, keyboard and horns) performs songs originally recorded by their heroes. PATRICK FORD - drums, ANDY JUST - hca, VOLKER STRIFLER - gtr, DEWAYNE PATE - bass. Special guests: ROBBEN FORD - gtr/voc, CHRIS CAIN - gtr, TONY LUFRANO - kbds, plus horns. Customer evaluation for "The Butterfield - Bloomfield Concert"